Low dimensionality, broken symmetry and easily-modulated carrier concentrations provoke novel electronic phase emergence at oxide interfaces. However, the spatial extent of such reconstructions – i.e. the interfacial “depth” – remains unclear. 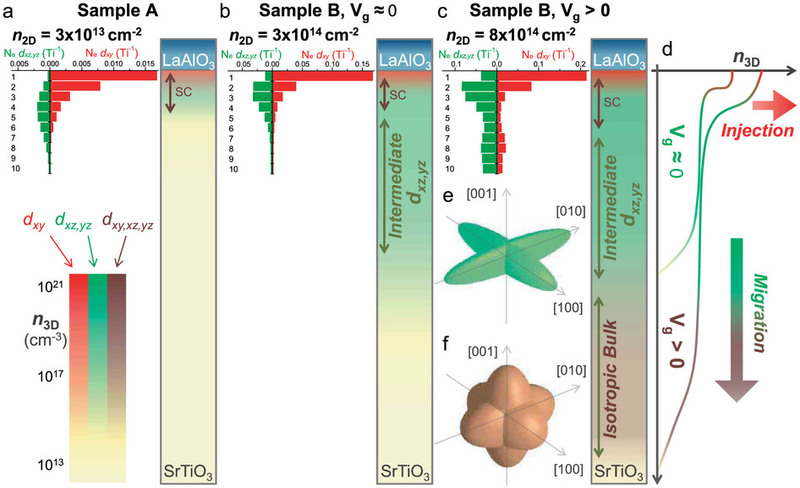 Examining LaAlO3/SrTiO3 heterostructures at previously unexplored carrier densities n2D ≥ 6.9 × 1014 cm−2, we observe a Shubnikov-de Haas effect for small in-plane fields, characteristic of an anisotropic 3D Fermi surface with preferential dxz,yz orbital occupancy extending over at least 100 nm perpendicular to the interface. Quantum oscillations from the 3D Fermi surface of bulk doped SrTiO3 emerge simultaneously at higher n2D. 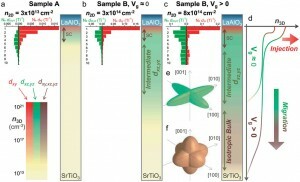 We distinguish three areas in doped perovskite heterostructures: narrow (<20 nm) 2D interfaces housing superconductivity and/or other emergent phases, electronically isotropic regions far (>120 nm) from the interface and new intermediate zones where interfacial proximity renormalises the electronic structure relative to the bulk. A. P. Petrović, A. Paré, T. R. Paudel, K. Lee, S. Holmes, C. H. W. Barnes, A. David, T. Wu, E. Y. Tsymbal & C. Panagopoulos, Sci. Rep. 4, 5338 (2014).